(Bloomberg) -- Venezuelan President Nicolas Maduro is under unprecedented pressure after the U.S. and other nations recognized opposition leader Juan Guaido as the country’s rightful head of state and protests against the ruling regime expanded. 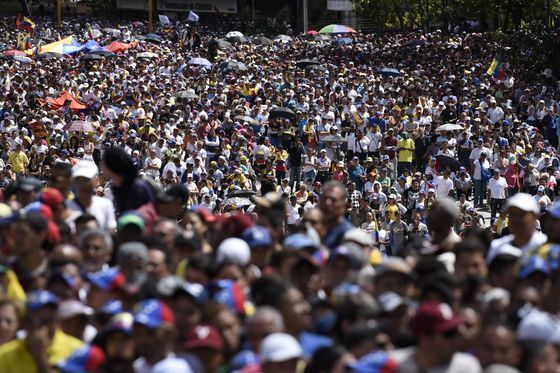 Venezuelans took to the streets in the biggest opposition protests since mid-2017 to back Guaido and increase pressure on Maduro. While the leftist government crushed violent protests two years ago, this time poorer areas of the capital are leading angry demonstrations over failed public services, food scarcity and rising prices. Local press showed crowds gathering in major cities. Maduro responded by breaking diplomatic relations with the U.S., giving American diplomats 72 hours to leave the country. Guaido said the diplomats are free to stay in the country. “The United States does not recognize the Maduro regime as the government of Venezuela. Accordingly the United States does not consider former President Nicolas Maduro to have the legal authority to break diplomatic relations with the United States or to declare our diplomats persona non grata.” Secretary of State Michael Pompeo said in a statement on Wednesday evening. Diosdado Cabello, the powerful No. 2 in Maduro’s socialist party, called on supporters to keep vigil at the presidential palace Wednesday night to defend the government. Defense Minister Vladimir Padrino said in a tweet that the country’s armed forces wouldn’t accept a “self-proclaimed” president. Venezuela’s loyalist Supreme Court had already announced that it would depose Guaido and nullify the assembly’s motion that declared Maduro’s rule invalid. The Trump administration has also prepared to sanction crude oil exports from the country, according to people familiar with the matter, but hasn’t decided whether to take that step. Maduro’s reaction to Guaido’s move will help dictate whether the administration imposes the sanctions, the people said. Senators who supported Trump’s move, including Republican Marco Rubio of Florida, also called for the U.S. to designate Venezuela a state sponsor of terrorism, which would trigger a new set of restrictions. A senior Trump administration official, speaking to reporters on condition of anonymity on Wednesday, suggested Trump will impose additional sanctions if Maduro doesn’t immediately turn over control of Venezuela’s finances to Guaido. White House officials had already warned some U.S. refiners earlier this month that the Trump administration was considering sanctions on Venezuelan oil exports and advised them to seek out alternative sources of heavy crude. The U.S. move to recognize Guaido risks a backlash, as Maduro is sure to warn that American “Yankees” are backing a coup against his government. But even invoking the checkered history of U.S. intervention in Latin American political affairs has worn thin for many Venezuelans and for opponents of Maduro throughout the region. 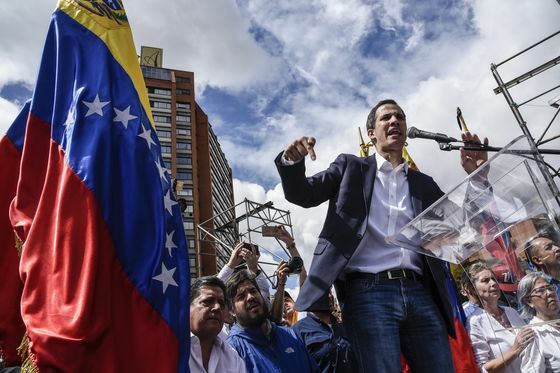 Guaido has sought a transition government and has called for new elections. He and his supporters say Maduro’s latest term is illegitimate; about 60 countries concluded the election was fraudulent. For now, at least, the competing claims of leadership by Maduro and Guaido may create a welter of confusion. Guaido may send an envoy to the Organization of American States, which has recognized his government. But at the United Nations, Venezuelan allies on the Security Council such as Russia and China would almost certainly block such a move. The U.S., in turn, could ignore Maduro’s representatives at the UN or demand that they be stripped of their accreditation. “You very well might have competing diplomatic representations abroad,” Marczak of the Atlantic Council said.